Opting for a natural effect wallpaper is an easy decorating solution that's effective in achieving a variety of on-trend design outcomes. Whether you're looking for a luxe oil-slick inspired wallpaper to complement a sophisticated scheme, or want to achieve a wood panelling effect (for a fraction of the price of the real thing) in a space with a stripped back, industrial feel, our pick of the best natural effect wallpapers provides the inspiration required for redecoration. For more things wallpaper, go to our hub page. And, once you've made your all important choice, check out our step-by-step guide to hanging wallpaper. Successfully creating a subtle and sophisticated effect that's fascinating to look at, oil-slick inspired wallpaper makes the perfect addition to a scheme with a luxe feel. Pair with on-trend pastel tones and delicate copper pieces for a look that's reminiscent of a high-end hotel. Find this Anthology Obsidian Panel in Snowflake at John Lewis & Partners. If you're nervous about using a bold animal print, consider limiting it to a small space, like a cloakroom or small bathroom, where it will make a dramatic impact without looking overwhelming. If you're tempted by zebra, try this Serengeti Nights textual print wallpaper from Wallpaper Direct. Find more advice about designing a small bathroom in our guide. Get on trend with a wallpaper design that recreates the look of a classic terrazzo floor. Paper above the dado rail, pairing with a shade that complements specks of colour within the design for a cohesive finish. Pair this gorgeous Ferm Living Terrazzo Wallpaper from Cloudberry Living with Invisible Green from Little Greene or Gull's Wing from Designer Paint. If you're looking to design a space with a distinctly contemporary feel, consider opting for a natural effect wallpaper with a concrete look. This stripped back look is particularly effective when paired with furniture in pastel shades and other grey interiors. Recreate this look using the Concrete Texture Effect Wallpaper from Woodchip & Magnolia. If you like the feel of a space with a laid back, unfitted style, wood-effect wallpaper makes a great addition and requires minimal effort to install. 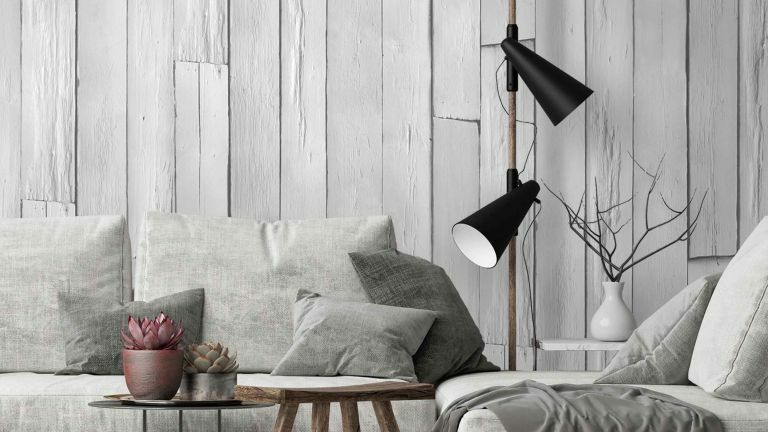 Simply pair a white-grey toned natural effect wallpaper – we love the Plank It Wallpaper from Woodchip & Magnolia – with furniture of a similar hue for a contemporary space with a distinctly laid back feel. The go-to aesthetic for hipster hotspots, plywood (or in this case plywood effect wallpapers) are an easy option for a space that's contemporary and minimalist. Pair with low maintenance furniture and muted artworks for a stripped back, unfitted finish. Find this NLXL Plywood Wallpaper at John Lewis & Partners. For a pared back, natural effect, we love the idea of using a wallpaper that replicates plasterboard – sounds ridiculous, but the results are surprisingly stylish. The Plaster Texture Wallpaper in neutral from John Lewis & Partners bridges the gap between elegant and industrial, making it the perfect addition to a contemporary living space. When designing a space with a natural effect wallpaper, opting for a design that doesn't have a repeat finish is a must if you're adamant about creating a realistic looking finish. This gorgeous NLXL Brooklyn Tins Wallpaper from John Lewis & Partners not only avoids repeat patterns, but is also paste-the-wall, allowing for easy application. Available in a variety of shades, you're guaranteed to find a style that suits your space. Marble effect wallpapers make a pretty addition to a home with a distinctly millennial feel, particularly when paired with a collection of abstractly shaped house plants and furniture made from natural materials. We love the use of blush and white shades in this Marble Effect Wallpaper from Woodchip & Magnolia. If you love the idea of a stripped back, brick wall but either can't, or don't want to, commit to the real deal, a wallpaper can achieve a similar effect for a fraction of the effort. Thanks to its quality design, this Vtwonen Large Factory Wall Ready Made Mural from Graham & Brown creates a realistic looking finish. Find out how to use brick to create a feature wall, don't miss our feature. If you like the idea of animal print (like the zebra print we showed further up), but don't want to commit to something quite so bold, a wood effect wallpaper can make a toned back alternative – especially if it's in a light brown or white colour way. Find this Cypress Beige and Rose Gold Wallpaper at Graham & Brown. If you like the idea of a wood-effect wallpaper, but the rustic or unfitted feel of wooden planks doesn't appeal, consider opting for a design that replicates the effect of wood laid in a herringbone style. The lighter the finish, the better, if you're looking for a more subtle look. We love this Painted White Chevron Wallpaper from Woodchip & Magnolia, paired with other neutral toned accessories.